Attach to dotnet.exe extension for Visual Studio 2017 & 2019 now has a new version 1.0.0.1. As the version number indicates, only a small thing has changed: The extension manifest had problems with its dependencies, causing issues when trying to install the extension to VS 2019 Preview. Unfortunately the extension is still not available through the Visual Studio’s extension marketplace, but I hope to have it there in the following week. 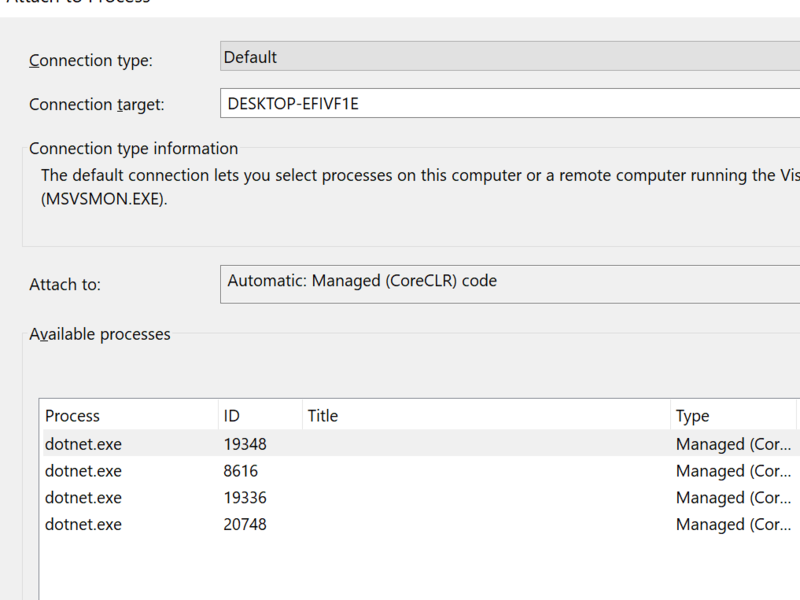 Just a quick recap and reasoning for the extension: There’s usually many dotnet.exe processes. Attaching Visual Studio’s debugger to the correct one can be hard. 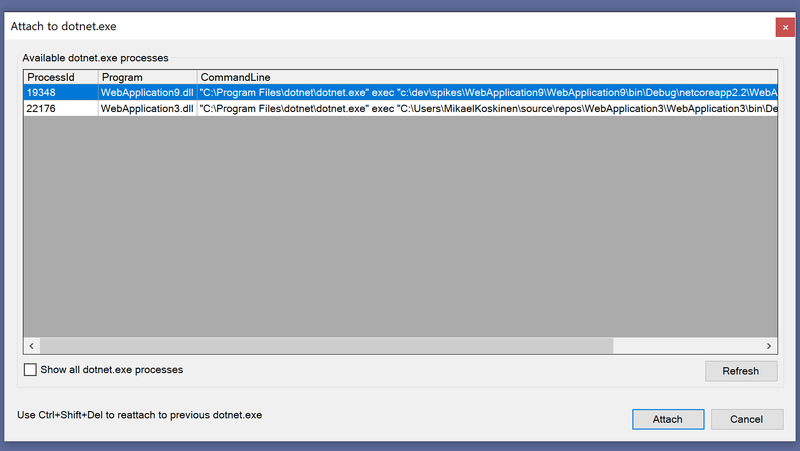 This extensions aims to solve the issue by displaying the actual .DLL of the dotnet.exe process. Alias engine is a new MIT-licensed open source C# & .NET Standard based engine for creating aliases for your commands. It's inspired by the alias support which mIRC provides. Example: Alias “ae” can be used to execute command “Alias Engine”. The project can be found from GitHub and the engine is available through Nuget https://www.nuget.org/packages/AliasEngine/. What is an alias and what you can do with them? Aliases can be used to shorten commands. If your application provides a “help” command, you can provide a shorter alias “h” for running it. Alias Engine can also be used to provide alias feature for the end user. Your application can provide a fixed set of commands like “help”, “show”, “create” and the user of your application can create aliases for executing the commands. The extension aims to solve this issue by parsing the actual application from the process’ command line. In addition to displaying and attaching to a particular project, the extension provides “Reattach to dotnet.exe” command. This functionality works even if the process id changes (as it does when using dotnet watch). Note: For now the extension has been mainly tested with ASP.NET Core 2.0 based applications. Later versions of ASP.NET Core and .NET Core may change things so it’s possible that the extension displays these processes incorrectly. AngleSharp is a HTML parser library for .NET. Previously I’ve mainly used Html Agility Pack for parsing, but AngleSharp seems to be getting quite much traction nowadays. Where document is of type IHtmlDocument and image is of type IHtmlImageElement.